The lakes of Bhoj wetland that are home to many bird species and provide water to the local residents are now polluted and need urgent attention from the government. Raja Bhoj statue at the upper lake. The Bhoj wetland is situated in the heart of Bhopal district in Madhya Pradesh. The wetland consists of two man-made lakes--the upper lake and the lower lake. The upper lake, the oldest among large man-made lakes in central India, was created by king Bhoj in the 11th century by constructing an earthen dam across the Kolans river and the lower lake was constructed nearly 200 years ago mostly from the seepage from the upper lake. In 1995, the Madhya Pradesh government initiated a Rs 2.5 billion project for the conservation of the wetland with the money borrowed from the Japanese Bank For International Cooperation (JBIC). In 2002, the Bhoj wetland was recognised as a wetland of international importance under the Ramsar Convention of 1971. As per a report by the Centre for Science and Environment (CSE), the upper lake has reduced from the initial 30 sq km to 8 sq km now. The lower lake also got reduced from 8 sq km to 2 sq km in 2009. The total length of the lake was 38 km, but it got reduced to 5 km in 2009. The upper lake in Bhopal is an important wetland which is home to more than 700 species of diverse flora like zooplankton, phytoplankton, etc. The wetland is also an important site of avian fauna with more than 150 species of both migratory and resident birds. This rich biodiversity of the wetland has, however, been affected adversely in the last few years due to various anthropogenic pressures and natural calamities, irregular rainfall during the last decade being one of them. The upper lake is the principal source of drinking water (40 percent) for the city of Bhopal; the lower lake meets out the requirement of raw water and enhances the beauty of the city. These lakes are ideal spots for watersports like kayaking, canoeing, parasailing and water skiing and attract tourists in hordes. The upper lake is a source of livelihood--both direct and indirect--for many communities including fishermen, boat owners and local vendors. The last six decades have seen rapid urbanisation near the Bhoj wetland resulting in various environmental problems. The water quality is getting deteriorated from the sewage inflow from urban areas, agricultural waste from rural areas and industrial effluents, apart from the flourishing growth of invasive aquatic plants, depletion of biodiversity and other anthropogenic activities. A 2012 survey report, Excreta Matters, released by the CSE says that out of the 193 MLD (Million Liters Per Day) of sewage officially generated in Bhopal, only 39 MLD sewage gets treated. 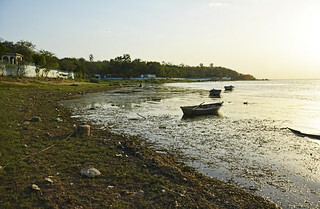 The remaining sewage goes into water sources like the upper lake which is also a source of drinking water for 40 percent of the Bhopal's population. The lower lake does not have any freshwater source; it receives seepage water from the upper lake and drainage from 28 sewage-filled nullahs. As per a study by Current World Environment, a journal on environmental science, the lower lake inhabited about 50 species of microflora and fauna during the year 2000 which was reduced to 31 species in 2011. However, another study conducted by IIT researchers in 2013 on the conservation plan of the upper lake reveals that there is an improvement in the water quality of upper lake after the government implemented the conservation plan over a decade ago. Senior researchers and water experts like Subhash Panday and K. G. Vyas argue that the efforts made by the government are not enough to stop the inflow of sewage into the upper lake. 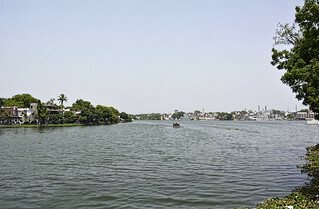 The sewage problem of the colonies residing along the upper and lower lakes have not been addressed properly and stopping the domestic sewage from entering the upper lake from areas like Nehru Park, Gandhi Nagar, CTO, Noor Mahal, Malipura, etc calls for extra effort from the government and the people. Dredging and de-silting are required to improve water quality. The government needs to develop a sewage treatment management scheme to stop sewage from entering the lakes. Solid waste management and other shoreline or fringe-area management activities besides deweeding, aquaculture and installation of floating fountains are also needed.